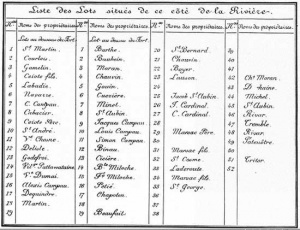 At some time before the American Revolution, the parcels came under the ownership of Charles Courtois, Francois Berthelet and Charles Beaubien. In 1783, all three parcels were purchased by the merchant firm of Macomb-Edgar-Macomb (William and Alexander Macomb, and William Edgar). At some point all of the property became the estate of William Macomb and was then passed to his three sons, David, William and John. It was from the Macomb family that Lewis Cass purchased the entirety of the property in 1816 for the sum of $12,000. 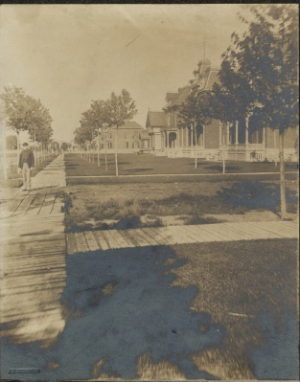 From 1830 to 1836, the population of Detroit grew so rapidly (from 2,222 in 1830 to 6,927 in 1836), that the front portion of Cass Farms from Larned Street to the River was needed for wharves, warehouses and hotels to facilitate trade. So in 1835, the Cass Farms Company was formed and purchased the front section from Lewis Cass for $100,000. As Detroit became a leading manufacturing center in the last 2 decades of the nineteenth century, and the population doubled in size, many professionals and managers were looking for housing that would reflect their increased status. This area was considered a prime location as it was close enough for those who still had to commute by horse and carriage. Leading architects were hired to develop these substantial homes. 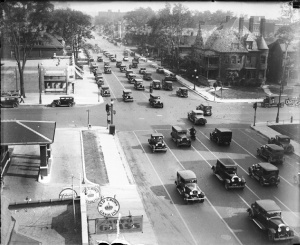 By the 1920's, this area, particularly along Cass Corridor, was home to many of the first automobile dealerships, and this was the first use of the structure that now houses the Green Garage. The area began to decline during the Great Depression, when most families found that they could not maintain such vast residences. Many of these homes were rented to multiple families, who often did not keep them up. 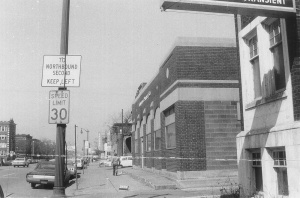 During the 1950's and 1960's when the population of the area decreased sharply, the area went into further decline, and in the 1970's and 1980's, the Cass Corridor was known as an area of numerous illegal activities. The area has seen a resurgence since the 1990's with increased student populations, Cultural Center and medical center activity. The Warren-Prentis district contains 108 historic structures, and is notable because the majority of the pre-1930's building stock remains. Living at this address beginning in 1882 were John B. Mulliken, his wife, Emma A. (Batcheldor), and sons Harry B. and George F. John Mulliken was born in New York in 1837 and his wife was born in Vermont, also in 1837. While living at 800 Second Ave., he was the General Manager of the Detroit, Lansing & Northern Railroad, the Chicago & West Michigan Railway, and the Citizens' Street Railway Company. The office of the Detroit, Lansing & Northern Railroad was located at 28 Newberry Building. In 1891, John B. is listed as a commissioner at the Board of Public Works. He was also a Civil War veteran, having served with the Fourth Cavalry from Hillsdale County, Michigan. John B. died on Nov. 23, 1892 at the age of 55. Emma Mulliken remained in the house with son, Harry, a student, until sometime between 1895 and 1896 when she moved to a new address at 91 Farnsworth. Their son, George F. Mulliken, born in Belvedere, Illinois in 1867, attended the Michigan Military Academy from 1886 to 1888, after which time he enrolled at the University of Michigan, graduating in 1892 with a Bachelor of Arts. He then went to work for Cooper, Wells & Company of St. Joseph (Berrien County), Michigan where he was a major stockholder and Treasurer of the company. Cooper, Wells was a manufacturer of women's and girls' hosiery and one of the largest business concerns in Berrien County. Susanna T. (Anna) Ross, widow of Edward H. Ross, with son, John L., moved into 800 Second Ave. around 1897. US Census records indicate that Susanna was born in Ireland in 1838 and immigrated to the US in 1848. John L. Ross owned the Ross & Young Machine Co, manufacturer of automotive parts and engines. In 1915, Ross & Young, which had become the Ross Automobile Company, debuted the "Ross Eight" automobile, priced at $1,350, at an automotive exhibit held in Chicago. The 8-cylinder engine was attracting a lot of attention at this exhibit. 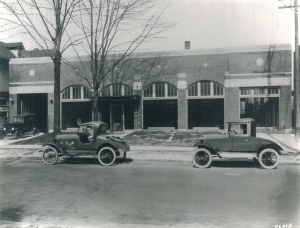 Other automotive manufacturers exhibiting 8-cylinder vehicles that year were Cadillac, Cole, Abbott, Remington, King, Briggs-Detroiter and Regal. From 1904-1905, also listed at this address is the Eugene Chemical Company. The John D. Doyle family moved into 800 Second Ave. in 1913. Family includes wife, Suzanna (Susie), son, Thomas Allen, and boarder, Florence R. Cook. 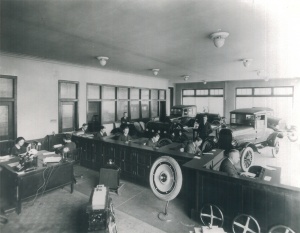 Thomas worked as a chauffeur for the People's State Bank. Florence Cook was a dressmaker. According to US Census records, the Doyle family was originally from New York. Worked as a foreman at the Michigan Shade Cleaning Co.
During these years, Colin Fox was employed as an accountant for the United News Association. Prior to this time, he worked for the Western Union Telegraph Company. Jacob Cotner, Jr. was the Secretary and Treasurer of the Collector Publishing Company (later to become Sprague Publishing Company) located in the Telephone Building on Clifford Street. Born in Mansfield, Ohio in 1860, he spent his youth in that state and, as a young man, worked primarily as a salesman for a variety of business interests. 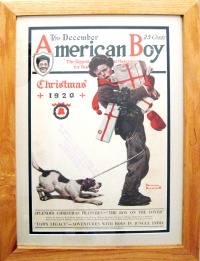 He moved to Detroit around 1889 and, while working for the Collector Publishing Company, was instrumental in the development of "The American Boy" magazine (first published in 1899), a highly successful and popular publication in the early part of the 20th century, becoming its business manager. He married Etta Marie Trowbridge of a prominent family from Toledo and they had three children. His wife passed away in 1899 and in 1901 he was married to Celia L. Burke of Ann Arbor. Upon his death in 1921 at the age of 60, The Detroit Free Press said of him, "Mr Cotner did a practical work for the youth of this country that can scarcely be estimated. He was one of those who went to the root of the matter in an endeavor to help build up the citizenship of the country". In addition to his work in the publishing industry, Mr. Cotner was on the board of trustees of the First Congregational Church of Detroit, served for 8 years as a director of the Detroit YMCA, was president of the Ohio Society of Detroit and was a member of the Detroit Golf Club. William Radcliffe was a clerk for D.M. 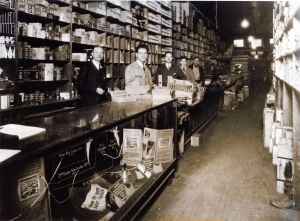 Ferry & Company, a seed company that was one of the first ever to package seeds for sale in stores. The company was founded by Dexter Mason Ferry of New York who came to Detroit in 1852. By 1902, D.M. Ferry had purchased land in Avon Township off of Hamlin Road in order to more easily expand operations. The "descendant" of this company, The Ferry-Morse Seed Company is today located in Fulton, Kentucky. Robert Waddell was vice president and co-founder of the Independent Stove Company, established in 1905 by three former employees of the Michigan Stove Company. By 1908, the operations had moved to Owosso, Michigan where a new building was constructed to house offices and a foundry. Their product line expanded to include a variety of stoves, ranges, furnaces and oak heaters. In 1933, the name of the company was changed to the Renown Stove Company. They were in business for 45 years, finally closing their doors in 1950 having produced approximately 300,000 stoves and heaters in all. Van Ness Delamater was born in July, 1878 in Hudson, New York and was a graduate of Cornell University, class of 1900. He began work in 1915 for the Hyatt Roller Bearing Company, part of the railroad division of General Motors (this perhaps explains his one year stay in Detroit). He was married in 1904 to a fellow Cornell graduate, Jacqueline Montague Newton, and together they had five children. Sadly, he and his eldest son, Van Ness Delamater, Jr. (also a Cornell graduate) died in 1931 on a vacation trip to Algonquin Park, Ontario, when their boat was capsized during a strong storm and they both drowned. Claim Auditor, National Casualty Co. Living at 808 Second Avenue starting as early as 1885 (according to Dau's Detroit Blue Book) Eralsey Ferguson, his wife and two children, John G. and Joie E. Ferguson. Mr. Ferguson operated E. Ferguson & Company, cartage agents and freight handlers. The Detroit City Directory of 1864 shows that he was working as a depot master for the Michigan Central Railroad and resided at 164 Griswold Street. From 1880-1885, Ferguson was the landlord of the Cass House Hotel, once located on the SE corner of Third and River. He was a member of the First Congregational Church of Detroit and died in 1892. The Woolfenden family moved to this address shortly after the death of Frederick Woolfenden, a prominent Detroit banker and co-founder of the Dime Savings Bank. Living here beginning in 1893 was his widow, Ella Raymond Woolfenden and their four sons, George Raymond, Edward Percy, Frederick and Francis Raymond. Frederick Woolfenden was an Englishman born in Belfast, Ireland in 1847 and was educated in Manchester, England. 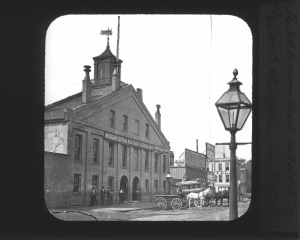 He arrived in Detroit in 1863 and immediately began work clerking in various banks, among them the Merchants and Manufacturers National Bank. Later he began working at the post office and was soon promoted to Assistant Postmaster, a position which he held for ten years. Leaving the post office, he co-founded the Dime Savings Bank of which he was Cashier and Manager. In addition to his business interests, Frederick Woolfenden was an ordained Episcopal minister and sat on the board of the Detroit College of Medicine. James worked as a clerk for Freeman Delamater & Co., and in 1909, as a city agent. By 1919, his widow, Barbara is living at this house with their children, Samuel, a machinist, and daughter, Wilma. The present building at 4444 Second Avenue was built on the site of the three homes mentioned above in 1920. Below is information gathered from the Polk City Directories showing the businesses that occupied this address from 1921 to present. 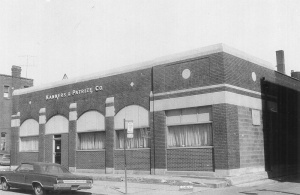 4445 Second Blvd.....Schad, Phillip G.
Wendt and Kanners, Samuel Kanner's earlier location at 33 Eliot St in Detroit. Around 1925. Samuel Kanners brought his shoe supply business to the building, establishing S. Kanners and Co.
Bob Zukowski begins work at S. Kanners and Co.
Victor Kanners and Samuel Patrize brought their shoe businesses together into the building. Becomes Kanners and Patrize. Bob Zukowski leaves and the business was sold to Frank Lucente's 2 sons, Frank and Douglas Lucente in 1990. The boys owned the business and the father owned the building. Dave Lucente sold out to Doug Lucente in 1996. 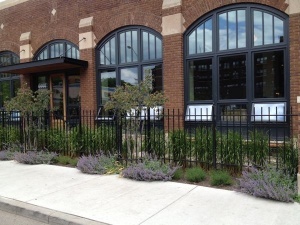 Building is sold to John Linardos of Motor City Brewing Works. John Linardos sells the building to Tom and Peggy Brennan. Construction on Green Garage starts. File:Stoker Poker and a Peg.pdf - Bob Zukowski's retirement speech in 1991 - great story! In 1945 Victor Kanners wrote of his remembrances of being a POW during WWII. The following links are his original thoughts, starting with a cover letter to his secretary, Dorothy, followed by his 2-part story. Finally, there are 2 post-war essays written by Victor, one in 1980 and one in 1987. 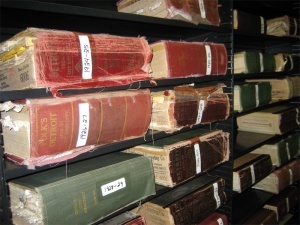 State U./Walter P. Reuther Library of Labor and Urban Affairs. Mike Smith or Cathy Schmelling. This page was last modified on 31 July 2017, at 15:24.